Christmas is a season for family, friends and getting together. This year, in this amazing community of North Grenville, everyone is invited to a special free Christmas Day gathering at Leslie Hall to celebrate and join in a tasty turkey or ham dinner, a traditional holiday meal for all of us to share. There is no charge for this event. 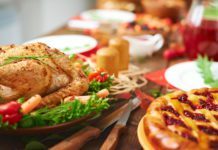 People and businesses from all parts of North Grenville are working together to make this event happen: supplying food, chefs, servers, in fact everything necessary to provide good cheer and company on Christmas Day. Live entertainment will be provided by Ron Donnelly. So, as a way to mark the holiday together, this is an open invitation to one and all to roll up to Leslie Hall between 11:30 am and 1:30 pm, take a seat and tuck in, along with friends and neighbours. Let’s face it: this is a wonderful place to live, when you think about it. A generous people, a scenic and restful location, and a place where people want to keep that rural, small town atmosphere. Right now, people all over the municipality are planning to gather together the meat, the veggies and the bread. Others are planning the preparation and the cooking, while still more are ready to serve the food, wash the dishes and clean the Hall afterwards. No tickets required, no need to book a seat: just come by and tuck in! Community Christmas meals are a tradition going back to the earliest days of settlement in this area, and it is a tradition that will be kept alive this year. Leslie Hall has seen many communal get-togethers over the decades, and it seems a fitting venue for Christmas, 2016 and for the future. Thanks to every individual and business joining in to make this happen.